In a far distant future, Humanity is long gone, its place taken by the younger races – what we would call aliens if we were still around. They live mostly peacefully under the constant threat of the Galactic Council of Elders bringing them peace if they don’t keep it themselves. Then, one day, a spaceship appears out of nowhere, much older than any of the younger races and potentially loaded with technology beyond their dreams. Technology for one of them to overthrow the Council and rule the galaxy in their stead. And so they all enter and explore the mysterious spaceship Andromeda. Calling them the younger races is weirdly appropriate, because under the Council-given rules the way they must explore the Andromeda is similar to how many of you probably shared sweets with your siblings: one splits, the other picks which part to take. It’s a bit more complex than that, but that’s the basic idea. In Andromeda, the first player rolls a handful of dice and then picks some of them to make an offer. That offer then goes around the table. If any player picks it up that player may pick one more dice from the remaining ones, then the first player prepares a new offer. But if the offer is bad enough that it goes all the way around the table without any takers, the first player has to take it himself. Just like you get stuck with the smallest helping of ice cream if you didn’t split it fairly. The next player that doesn’t have any dice yet prepares the next offer then. 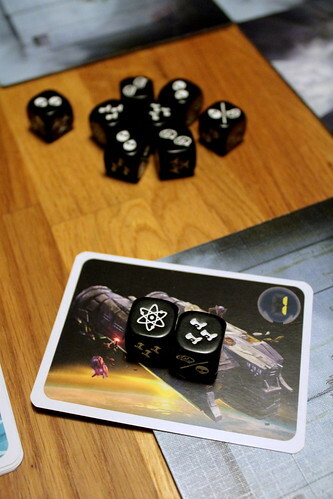 Together with the dice the offer contains the player order for taking actions. The player who took the first offer takes his actions first. Each die shows one action to take on your turn. The Contamination icon is sort of special because it’s mandatory and has to be used first. It kills off one of your brave explorer minis aboard the Andromeda. The rest can be used in any order, and they are all quick and simple. A die showing two brains lets you train two explorers from your pool. Only trained explorers can be sent to the Andromeda using a die with two faces. They can enter the ship in any room with one of the players’ teleporters inside. When the game starts, that is in the Portal room for all players, but everyone can put up more teleporters later. An Improvisation result on the die, an icon showing one brain and one face, lets you either train or teleport one explorer. But your objective is to explore the ship, not collect people in the start room. That’s what you do with a Movement symbol on your dice. Each of those gives you three movement points, one of which can either move one of your explorers into the next room or turn the next room tile over to discover it. Three points for one dice doesn’t sound like much, not when you get three or four dice per round and they only have a one in six chance to show movement. But the ship only has nine rooms and the game only has seven rounds, so the movement you get is usually sufficient. If all else fails, you can use any result as one movement point, a valuable option you should always keep in mind. Finally, a Technology result lets you use one of the four available technology cards. The Teleporter tech is always there and lets you place another teleporter on the Andromeda, the other cards change from game to game. All have in common that they can only be used once per round, a main reason why you might want to go first. You do all that to collect points, representing knowledge you gathered from the Andromeda. One way to gain points is to control rooms by having more explorers there than any other player. 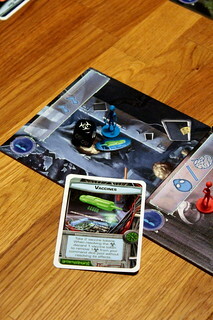 You lose those points again if another player takes control from you, but to make up for that controlled rooms come with the side benefit of offering more actions you can use on your turn, including some extra movement or removing opponents from the station. The other way to earn points is to complete missions. Missions can be pretty much anything, having the right number of explorers in certain rooms, losing explorers to contamination, having enough explorers trained but not yet deployed – anything. Each player has one secret mission in their hand at all times, but there are also public missions that go to the first player to complete them. Those later ones can be quite a pain because all the other players can guess what you’re up to, but it’s very satisfying to grab them before anyone else can.The game ends in one of two ways. 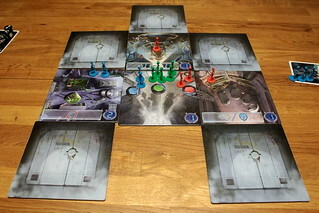 Either one player has enough points, depending on the number of players, at the end of a round and the game ends immediately. Or the seventh round ends, victory then goes to the player with the most points. Although players don’t trade or make alliances, Andromeda is a very interactive game. There is the interaction on the board, struggling for room control and competing for the public missions, but even more you interact through the offers. Figuring out how to get the dice you actually want is anything but easy, you have to put together an offer that is attractive enough for someone else to pick while keeping the dice you want for yourself back. Or make an offer that is unattractive to everyone but you so the first offer comes back to you and you can go first. It’s quite tricky, although the rules are very simple. However, depending what dice are offered to you, taking them or not may be the most interesting decision you make all round. Picking two dice to train explorers and two dice to deploy them is great for your board position, but it really doesn’t make for an interesting turn. That would be my one complaint against Andromeda, sometimes the best move you can make is rather boring. But hey, it’s not a bad move if it makes you win the game. And this, kids, is why you vaccinate! There is one more weirdly specific warning, though: never play Andromeda with people who only play to humor you. We all know someone like that, they’re not really into games, but they’ll play with you because they know you enjoy it. And usually it’s great they are willing to spend that time with us, doing something we enjoy more than them. But not in Andromeda. You just can’t play this game against people not making rational decisions. They will pick the offer that is completely useless for them, that you made specifically because it was useless for them so it would go through back to you, just because “they wanted to do something, it doesn’t really matter, does it?”. It’s just not possible to play Andromeda like that, sorry. We’ll gladly play something else with you! Anyone else, though, will be able to enjoy Andromeda. For a game you can explain in about five minutes and not leave out any important details it has a lot of tactical depth, and more direct interaction than many other euro-style games. Plus, if you lose the game, you can split the ice cream afterwards into small bowls for everyone else and a huge one for yourself and then tell them that you’re just not good at this cut-and-pick thing.